Get your mind out of the gutter! I’m talking about balls in sport, naturally. While many countries are predominantly a one or two sport nation, Australia is a many sport nation: many of those sports involve balls. Mr O and the ankle-biters come from a country that plays soccer. Big round mainly white ball with black bits. Soccer, soccer and more soccer. Mr O tells the story of when he first arrived in Australia and was detained. Not a lot to do in detention so when another detainee suggested going to the common room to watch “footy” Mr O readily agreed. He couldn’t understand this weird game at all: this wasn’t football! My family arrived home in the middle of the Australian Rules Football (AFL) season. Big, oval red ball. He did try to develop some liking for our form of football but I do believe he has so far failed. I’m hoping a family trip to an Essendon game might help when our footy starts up again. This is one of the things that surprised the kids: the choice of sports available. Each term at school they can play or learn something different. I’m sure I’ve missed a few, but the above are the main ones. Tennis is the name of the game at the moment as the Australian Open is on. Small, round, greenish-yellow ball. Miss O 1 loved her tennis classes at school and is trying to encourage Miss O 2 to follow in the footsteps of the Williams sisters. Miss O 2 is going to be tall enough. Australia used to be a major force in the tennis world, but of recent years we have struggled to produce a real star. We do tend to be dominant in swimming, but that doesn’t involve balls, so is a topic for another day! 😀 Tennis matches, especially in a Grand Slam, can take over five hours. Mr O asked last night, “Why does tennis take so long to finish?”. He wanted to switch over to a soccer match, of course. Mr O Jnr 2 has been playing both AFL and soccer at school, while Mr O Jnr 1 just sticks to soccer. Soccer has enjoyed a raise in popularity in recent years. Many new Australians come from countries where soccer is THE game for them. Also, many parents are concerned about the injuries suffered in AFL and Rugby and consider soccer a safer sport for their children. Rugby and AFL popularity depends on the state you live in. 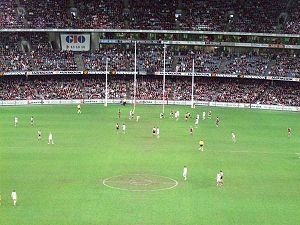 Victoria can easily be termed the home of AFL, while New South Wales and Queensland are definitely Rugby states. Cricket is a game that is played by England, Australia, New Zealand, India, Pakistan, Zimbabwe and a few other countries! Small, round, red ball. The concept is the bowler tries to hit the stumps which the batter is defending. The batter tries to hit the ball and score runs. Tests (the really proper version of the game) take five days to play. Long game! I’ve tried to play squash. I can’t say I am a fan. Belting a small ball against walls just doesn’t inspire me. I tried golf once too: couldn’t get the little white ball off the ground, let alone into a hole metres away that I couldn’t see. Hugely popular game here though, and we have The Shark as the great Australian player – not just on the golf course. To be successful in business in Australia, you MUST be able to talk at least the football code of choice in your state and cricket. Do not be surprised if you are asked which team you follow in a job interview! Very important stuff, you know! Which brings us to barracking. In Australia we barrack for our team, we do not root for our team. The latter word has an entirely different meaning here than in other parts of the world and is not something you would want to be doing for a whole football team – of any code! Yes, on that point you can pop your mind into the gutter for a moment. Australia is a sporting nation. We love to win and we play hard. Given our smallish population of 22 million, we hold our own on the world stage. Watch out for the green and gold! Yes, that too! We are a sporty nation, for sure. There are certainly a lot of different types of ball games in Australia. Do you know how many? Check out Robyn’s post! B is also for “behind” which is what I am running at the moment as I’ve had no internet for three days. We also have lots of choices here ~ volleyball, tennis, badminton, soccer, football, hockey, basketball, ping pong, etc. Not much in the way of rugby, though. Could have been VERY embarrassing! 😆 We also have volleyball, badminton and ping pong but I don’t think there are huge numbers involved. We DO play volleyball at Olympic level, so there might be a reasonable number of people involved I guess – but they don’t have that on TV or in the papers, for example. Basketball has the opposite ‘problem’ to the original football (soccer). It’s way too easy to score. There’s no real joy in scoring as there is so much of it. You can have great games of football that end 0-0 or 1-1. Missed penalties, great saves, last ditch clearances, an old fashioned fight! But, like any sport, there are plenty of bad games. It’s only when you see a good one, that you’ll understand the attraction and why it’s the undisputed world game. Maybe that’s why I never “got” basketball either. I agree, the complete opposite. Run down the court, score, run up the court, score, run down the court……. “World game” – THAT is what Mr O says ALL the time! That’s a lot of balls. We’re primarily a football, ah, gridiron, family but we enjoy a little baseball in the summer. It is America’s Pastime, after all. I’m a basketball fan, but only college basketball. Soccer? Bo-ring. Somebody score, already. I also didn’t realize that soccer balls are no longer black and white. Since when and why the change? I have no idea why the change. The boys just tell me “that was the olden days”. Mr O isn’t here, so I can’t ask him right now! 😆 I am sure he would know. Oh, and am I with you on the someone score already thing! Yep, you caught yourself with the gridiron – well done! I do find it interesting that as a multi-cultural country, we seem to have a high involvement in a LOT of sports, unlike other countries. Quite intriguing! 😆 I should get a lot more writing of my book done than I do, if I wrote each time Mr O watched football – but I tend to often be doing other things. At least Mr O doesn’t try to talk non-stop to me about soccer – he knows I don’t understand it. I do ask how his team went though, and listen to wailing when Arsenal lose! So there you can see how much soccer I watch! NONE!! I’ve tried, really I have – but it just is stupid to me with no scorring. Of course John and the kids think I am crazy! 😆 I just grabbed the ball from Wiki!